Naija Writers' Coach, a blog run by a Nigerian who specialises in "Helping Writers Live Their Dreams" is announcing the first of its annual essay competition tagged Naija Writers' Coach Annual Essay Competition. The contest is a national platform for Nigerians to express their opinions on pressing national issues, and advance workable and sustainable solutions to them. It is open to all eligible citizens of Nigeria. 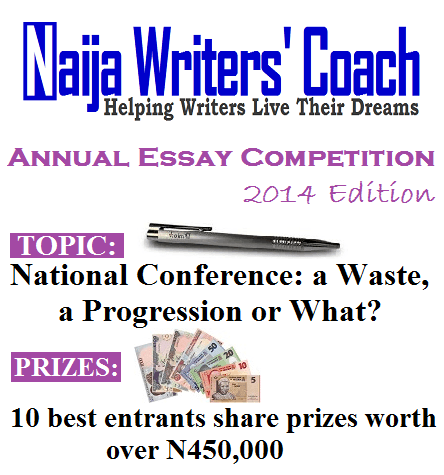 Entries are hereby invited for the 2014 edition of Naija Writers’ Coach Annual Essay Competition. Eligible candidates are encouraged to apply. Last year, eligibility for the competition was restricted to undergraduates and 117 students from 22 tertiary institutions put in for it. See 2013 Naija Writer's Coach Essay Competition. This year, the contest is bigger and the prizes heftier. Every Nigerian between the ages of 18 and 40 is eligible to enter, irrespective of level of education. So start writing … you could be one of the 10 smart winners the world is waiting to see. National Conference: a Waste, a Progression or What? The sum of N30,000, N20,000 and N10,000 would be awarded to the first, second and third prize winners respectively. The writers of the 10 best entries would each receive a Facebook ad credit worth N8,000. The writers of the 10 best entries would each receive a copy of the book, “Vertical Writing” by award-winning essayist, Muhammed Abdullahi Tosin, sold for N1,000. The competition is free to enter. No entry fee is required. Grading of entries would be solely on merit and winners would be announced in June 2014. Each entry must be between 500 and 700 words. Each entry must be typed in Times New Roman, font size 12 and double line spacing. No personal information like names and emails should appear in the body of the essay. Instead, the submission form will capture entrants' personal details. Only Nigerians aged 18-40 are eligible to enter (if you emerge a winner, evidence of age may be required). Submissions should be made online here. Submissions made by email would NOT be accepted. Each entrant must reference non-original materials appropriately and ensure that his/her essay is free from plagiarism. Each of these rules is sacrosanct. Defaulting entries would be disqualified. Ask your questions online via the official website - link to it is below (please don’t send your questions by email; no one would read them if you do).